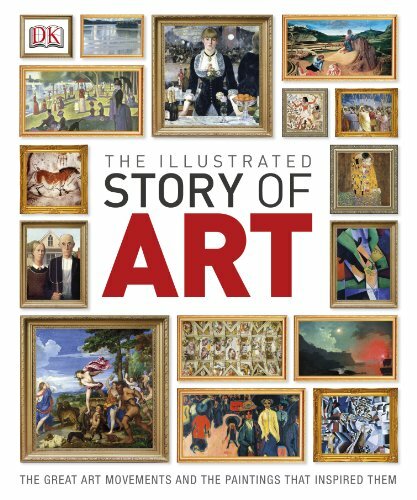 The Illustrated Story of Art is a book that looks at the history of art and its evolution. It really is quite fascinating to discover the rich history, the different art movement, artists and of course their artworks. This book published by DK is a large 400-page hardcover. It's very well laid out and written. For a book of this scape, there are actually four contributing authors, Iain Zaczek, Jude Welton, Caroline Bulger, Lorrie Mack. They each covered their area of expertise. The book is ordered chronologically into 5 sections, namely Ancient and Medieval, Renaissance and Mannerism, Baroque and Neoclassicism, The 19th Century and The Modern Age. It's a fascinating read. There are lots of interesting bits so I'll just mention a few. People started creating art from as early as 16,000 BCE. Those are the cave paintings. Then it moved on to the Egyptian art from 3000 BCE onwards and so on. There are wonderful paintings selected from each era together with insightful commentary. As for the general writeup, they talk a bit about the artist and how the artwork came to be created. Analysis are only for a handful of selected masterworks. Highly recommended to those interested in art and the history.